Awful footage shows a group of teenagers in ‘Make America Great Again’ hats mocking a Native American Vietnam veteran at the Lincoln Memorial. Nathan Phillips was attending the Indigenous Peoples March in Washington D.C. on Friday (January 18) when he was surrounded by the teens who began taunting him. Videos of the confrontation were shared on Instagram and Twitter, with one showing a young man standing uncomfortably close to Phillips with an unwavering smile on his face, staring at the older man as he played a drum and chanted. Nathan refused to be put off by the young boy and continued his chant without hesitation. According to CNN, the vet served between 1972 and 1976. He is reportedly a former director of the Native Youth Alliance, and holds an annual ceremony honouring Native American veterans in Arlington National Cemetery. Kaya Taitano, a student at the University of the District of Columbia, was present at the march and shot the video seen above. Kaya broke down the scene to CNN, explaining it all started when the teens got caught up in an exchange with four young African-Americans who had been preaching about the Bible nearby. The two groups reportedly started calling each other names and the interaction became heated, so Nathan stepped in to try and diffuse the situation by playing his drum and chanting what Kaya described was a healing prayer. Nathan walked through the crowd while performing, until he came face to face with the smug-faced boy in the video. This one kid just refused to move and he just got in Nathan’s face. They just surrounded him and they were mocking him and mocking the chant. We really didn’t know what was going to happen there. I was scared, I was worried for my young friends. I don’t want to cause harm to anyone. I don’t like the word ‘hate.’ I don’t like even saying it, but it was hate unbridled. It was like a storm. What the young man was doing was blocking my escape. I wanted to leave. I was thinking, ‘How do I get myself out of this? I want to get away from it’. According to Kaya the tense situation went on until a chaperone came and led the teenagers away. The boys in the video were students at Covington Catholic High School, an all-boys’ school in Northern Kentucky which is part of the Roman Catholic Diocese of Covington. 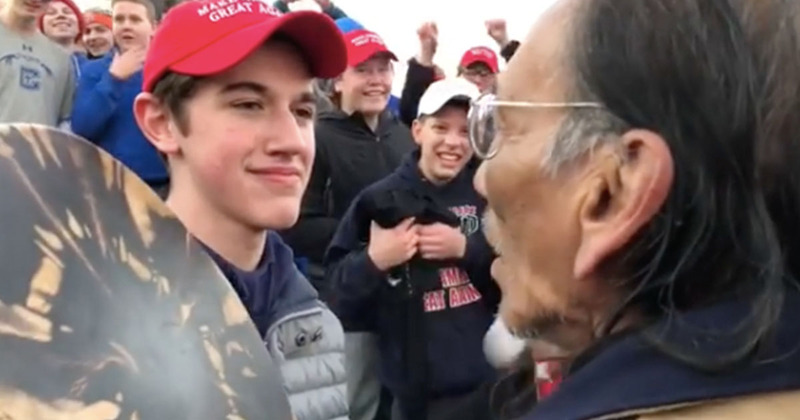 We condemn the actions of the Covington Catholic High School students towards Nathan Phillips specifically, and Native Americans in general, Jan. 18, after the March for Life, in Washington, D.C.
We extend our deepest apologies to Mr. Phillips. This behavior is opposed to the Church’s teachings on the dignity and respect of the human person. The matter is being investigated and we will take appropriate action, up to and including expulsion. Hopefully there will be repercussions for the teenagers’ disrespectful actions.